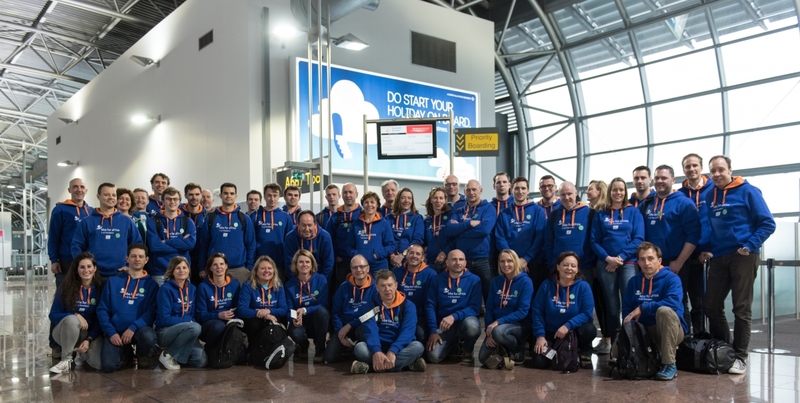 At 9AM sharp all 45 Brussels Airlines colleagues assembled at Brussels Airport to start the check-in for Bike For Africa. 45 enthusiasts eager to get on the plane to Dakar. We see old familiar faces like flight attendants Ulli and Josiane, Scandinavian Ground Operations Manager Asa, pilot Hilde,… But we also see some newcomers: Melodie from Revenue Accounting, Tim from the HR department, Anne, our VP Customer Experience. They are all joining Bike For Africa for the first time. Others were so eager to leave that they accidentally showed up a day early... Chris Burggraeve, one of the Gold Sponsors of Bike For Africa, erroneously thought his flight was today, although he was supposed to leave with the group of CEO’s that’s joining us tomorrow. When he discovered the mistake he said to himself he might as well leave today then. So off he went. To the question “So, are you ready for the mountain biking?” everyone gives the same reply: “we’ll see in a few days.” These people are way too modest, I bet they are in great shape. After arrival in Dakar, we’ll head for Les Manguiers de Guéréo à Mbour, where we’ll spend the first night and where everyone can mingle over dinner. Tomorrow is a big day, as we’ll visit the Muriel Africa Maternity, one of the humanitarian projects that Bike For Africa is supporting.